A newly released Chinese propaganda film showcasing communist forces in China’s eight-year World War II struggle with Japan, has dominated the box office—if you believe official reports in state-run media. The truth is more about bureaucratic pressure and manipulated statistics. As China celebrated the 70th anniversary of its hard-won victory over the Imperial Japanese Army in 1945, the communist regime was working hard to push its own politically charged narrative of China’s wartime history. “The Hundred Regiments,” which glorifies the only major battle fought by Chinese communist forces during the entire war (the communists’ rival for the rule of China, the Nationalist Party, was the main force resisting the Japanese), fits in with the Party’s politically correct view of 20th century events. But even as the film received praise from over 150 Chinese entertainment personalities, and reports claimed that it had outsold even the acclaimed martial arts film “The Assassin” by Taiwanese director Hou Hsiao-Hsien, it turns out that attendance at “The Hundred Regiments,” with its politically favorable message, was contrived. In one showing of “The Hundred Regiments,” a reporter from Phoenix New Media found that despite the tickets supposedly being sold out, many seats remained empty. According to Phoenix New Media, a Chinese news agency, Communist Party authorities issued directives, circulated online, to cinemas and distributors, telling them to give “The Hundred Regiments” advantages. Groups were specifically organized to see the film and boost its otherwise lackluster attendance. In addition, statistics were inflated to fabricate the impression of better sales. In one showing of “The Hundred Regiments,” a reporter from Phoenix New Media found that despite the tickets supposedly being sold out, many seats remained empty. Chatting up a number of young male moviegoers in the front rows, the reporter found that they were all acquainted—apparently students organized by their schools to see the film. One told the reporter he was worried he might fall asleep, since he was required to write a reflection to the film. A report by the BBC said that many Chinese theaters confirmed the existence of a “special revenue-sharing arrangement” in exchange for supporting “The Hundred Regiments.” Zhou Baolin, deputy general manager of the China Film Group Corporation, told BBC that “a good reception” was achieved due to the attention of local governments and Party committees, as well as active cooperation on the part of cinemas. The Chinese film industry in general is ridden with inflated records and other forms of corruption, according to reports. Led by Chinese communist Gen. Peng Dehuai, the real-life Hundred Regiments’ Offensive, carried out in 1940 behind Japanese lines, was the only major Communist Party military operation in World War II. 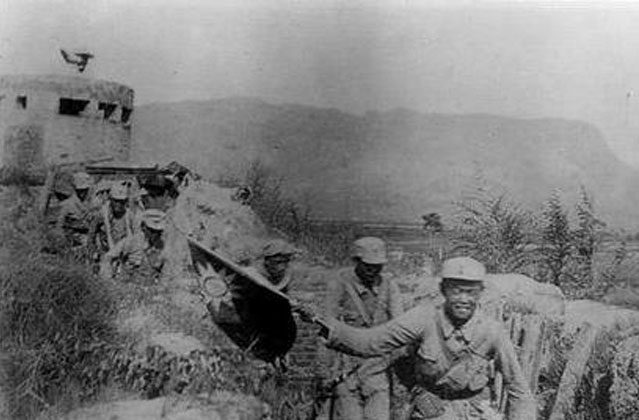 By comparison, Chinese Nationalist Party forces held out against the Japanese in dozens of major battles, some of which involved millions of men. Chairman Mao, leader of the communist forces, later criticized Peng for supposedly revealing the strength of the communist troops by carrying out the operation. China has recently commemorated the date of Japan’s invasion of 1937, including by staging anti-Japanese reenactments in public parks. A veteran U.S. Marine lays clear the history of World War II that the Chinese regime is now trying to hide for political gain. Authors send a warning about what could start World War III.